Wilmina Mae (Wilkey) Jennings was born in Douglas Township, Montgomery County, Iowa, to Harold Aaron (Jack) Wilkey and Lula Olive (Wagaman) Wilkey January 18, 1925. 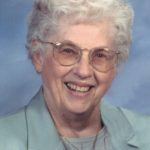 Wilmina lived, loved and served the Ellston and Ringgold County area since about 1939 when her parents moved to a farmstead one mile north of Ellston. Being the eldest daughter of nine siblings, she helped neighbors and her own mother with household, gardening and new-baby chores. In the spring of 1942, after high school graduation, she went to Shenandoah, Iowa, for three years working as a “shop girl.” Flirtatious patrons at the cafe where she first worked just could not be tolerated, so she found work at a hardware/department store. Soon, Wilmina was beckoned back to Ellston by one young husband-to-be, David Jennings. The young couple set up housekeeping northeast of Ellston on the Union County line and they have lived within a ten mile radius of Ellston these many years. Starting in about 1946, Wilmina has served her community primarily through her church work in the Ellston United Methodist Church. Lore tells us of Saturday night Bible study followed by a few lively hands of cards among the many diapers to change and babies to rock. As life hurried along, there were 17 nieces and nephews to rock as well. Wilmina served many offices in the local and district United Methodist Women and county offices of the Farm Bureau. She was very active alongside David in the farm work where she literally plowed under her diamond. Then there were all the chores of a homemaker living on the farm. Wilmina excelled in cooking, gardening, food preservation, sewing and crafts – continuing with her crochet until about a year ago. It was amazing how she could manage to make something lovely out of whatever was at hand. Another area of excellence was her work as a nurse aide in various nursing homes of the area; issuing concern for her patient’s comfort and dignity foremost. David and Wilmina moved off the farm to Tingley in 2000 and shared travel to Canada, West Coast, East Coast, Gulf Coast and Mexico during their retirement. They had two children – D.A. Jennings (Judy) of Branson West, Missouri and (Mary) Suzanne Adkisson (Dennis) of Grand River, Iowa. 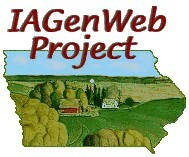 The next generation has added five grand-children: Julia Hunt (Craig) of Beaverdale, IA; Jeffrey Adkisson (Angie) of Winterset, IA; Lyle David Adkisson(Amber) of Scholfield Barracks, HI; Joel Jennings (Hannah) of San Diego, CA; and April Adkisson (Björgvin Gíslason) of Ramstein AFB, Germany. So far 12 great-grandchildren: Dartanyen,18, Promyce,16, and Mykailee,14, Adkisson (Winterset); Fjóla Björgvinsdottir, 10, David,12, Gísli,9, Björgvin, 6, Björgvinsson; Shelby Rae Day, 19, Emma Jane,11, Clark David,4, Lilly Grace, 2, Adkisson; and Angel Baby Henry Harrison Hunt (born December 2011). Wilmina has been preceded in death by her parents, brothers Sam, Jim, Leonard and Frank, sisters Baby Rae and Iona Jill. Surviving are brother Jack Wilkey of Ellston and Helen Robbins of Jefferson City, MO. Memorial Services will be at 10:30 a.m. on Saturday, January 20, at the Ellston United Methodist Church with Pastor Jud Stover officianting. Visitation will be from 9:00 a.m. to 10:30 a.m. at the Ellston United Methodist Church. Burial will be private at the Grand River Cemetery in Grand River, Iowa. Memorials will be to the Ellston United Methodist Church, HCI Hospice of Mount Ayr or Mount Ayr Health Care Center.